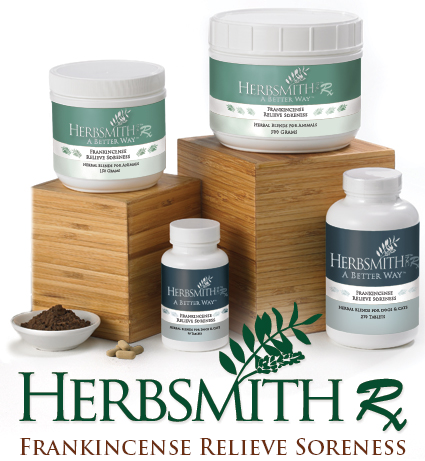 Herbsmith Frankincense Relieve Soreness maintains a healthy musculoskeletal system, even in the roughest of play. May aid discomfort from everyday training, competition or daily activity. From occasional aches to discomfort caused by everyday activity, Herbsmith Frankincense Relieve Soreness provides the solution. This unique combination of herbs has gentle and harmonizing properties, making Herbsmith Frankincense Relieve Soreness the ideal natural alternative. In Chinese theory, these herbs have been very successful at quickly managing discomfort and supporting the normal healing process. Herbsmith Frankincense Relieve Soreness is a must for any dog household. Keep a bottle of this fast-acting formula on hand for occasional use. This formula can be utilized for short-term or everyday use. Herbsmith Frankincense Relieve Soreness is a blend of blood-moving herbs. From a traditional Chinese standpoint, normal, everday activity and exercise can lead to acute stasis or stagnation of blood. With time, this stagnation affects the flow of energy, or Qi (pronounced “chee”), to the affected area. Herbsmith Frankincense Relieve Soreness is designed to move the blood and energy in the affected area. Without the stagnation of blood, the discomfort diminishes, returning the dog to full function as quickly as possible.